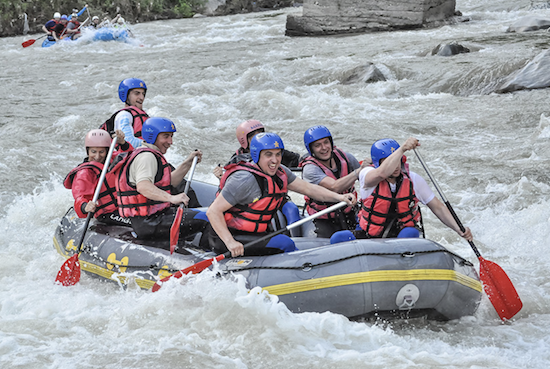 Rafting on Struma and the Kresna Gorge is a Bansko activity with thrills and a few spills. 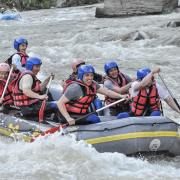 This white water rafting activity is on the Struma river which is 45km from Bansko, or 115 km from Sofia, is an adrenaline soaked Bansko activity that starts from 1st April until late July / early August, depending on river flow). The Struma gives us excellent white water rafting as the snow melts in the mountains in April to June. The rapids are something to experience. There is plenty of time to understand paddling technique and tale in the stunning surroundings before setting off. This activity is always popular at peak times, so be sure to book well ahead. includes transport pick up and drop off from Bansko/Razlog accommodation. From Sofia can be arranged at extra charge. Includes instruction, guide, wetsuits and all equipment. Come prepared to get wet. We also arrange car hire and transfers at very competitive rates all year round. Download the Bansko App to book, or contact us for a quote.